Two people face more charges following a separate animal cruelty investigation into horse neglect west of Edmonton. 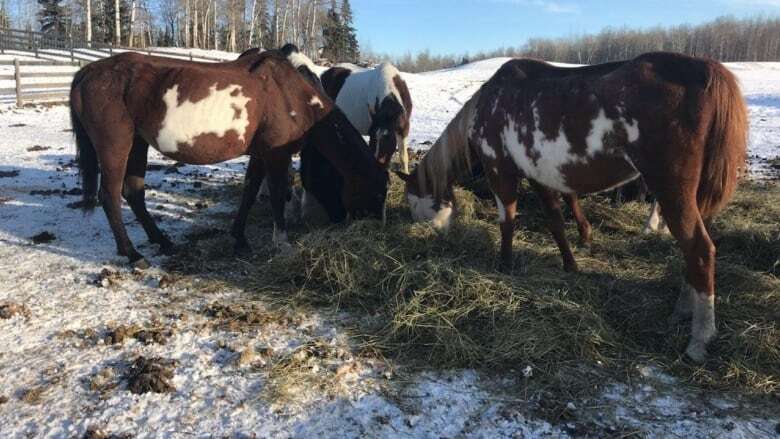 The Alberta SPCA says it began receiving complaints last month of dead horses or animals in distress on two properties in the Evansburg area. The SPCA has laid 27 charges each against Patricia Moore and Ross Atkinson under Alberta's Animal Protection Act. The charges include causing an animal to be in distress, failing to provide adequate food and water and failing to provide adequate care when an animal is wounded. Moore and Atkinson are to appear on these charges in Evansburg court on March 11. Moore and Atkinson already face more than 60 Criminal Code animal cruelty charges following an RCMP investigation into conditions on a rural property in the same area. Mounties have said that 65 horses and six dogs were taken from the property near Entwistle during the investigation. The 65 animals were alive but needed to be checked by veterinarians.